« It’s My Track… No It’s Mine! Who Got There First? Use the ‘Ask a Question’ link below any posting to post a question for our 10,000 readers weekly. At our club (where we can only run trains of that length after hours), we have two sets of super elevated curves, including one leading into/exiting a helix. Cars only tip over if internal weights are not secure and shift, we are pushing back with misweighted cars in the wrong position in train, or a car details and snags something on the ground. Superelevated tracks are designed to counteract the centripital force of a carriage when tackling a curve in correspondence with the factors of weight, speed and drag. Not merely an esthetical issue. So when we superelevate model tracks we must also take these elements into account (something that demands some fine calculation b ased on the carriages we use). 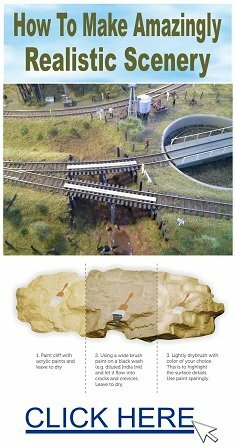 Because drag in a model scale track is not exactly comparable with real life realities, depending on the formula you use the resulting suggested superelevation to be used in a model layout might not be suitable and carriages might nonetheless tip over. One of the tricks to use is to be sure there are no under or over weighed carriages mid train. Another trick is to establish train speed and once results are the ones expected keep to that speed so as to be sure that over friction (resistance or drag) is not generated that could stall an axle resulting in a derailment. My expereince has indicated that it is unwise to use superelevation other than in long stretches of track and in big curves if I do not have adequate control of the superelevation justifying factors. I would not use superelevation in a small radious. I use to run long trains and also ran into many problems, mostly burning up engines. So I cut way back and maybe run a dozen cars behind one engine. And remember that these are models and most layouts do not need to run really big long trains. Hint: if your track is less than 10 feet overall in length, 5 or 6 cars will do and help keep the realism. 10 to 20, maybe three to four more cars. Got a lot of curves, then cut back on length of train. Remember have fun, not aggravation. I also like to run long trains once in awhile. But I also agree to stay with shorter trains due to the wear and tear on motors and gears on helix’s and curves. The engines have to pull harder around curves, but it also depends on the radius. Superelevations are more for looks, I personally would stay away from them unless your trying to copy a prototype. Hope this helps. G’day I’ve run several large trainsof 60+ Auto racks on a friends layout that has super elevated curves and grades up to 2.2% and had no issues. My double stack Twain with midtrain helpers and moving 95 stacks has only ever had an issue when one of the mid helpers died and the lead locos pulled the train over. You can get issues with super elevation even with short trains if you run light and heavy stock in the same train, but generally if you run at realistic scale speed and not crazily slow like some folk do the train is less likely to derail on super elevated curves than flat ones. Long trains and poor controllers don’t mix, I use Morleys and home made diode based controllers which vary the voltage and give motors and gears an easy time, PWM controllers at slow speed settings will damage motors and gears with their rough jabbing spikes of power. No doubt about it that long trains are more realistic than short ones. I have shown non enthusiasts videos of my layout and they are visibly impressed by the length of the trains as they pass the camera, they only expect half a dozen wagons and when 30 or more have come by they seem mesmerised! In my opinion it depends on the physical size if your layout and the pulling power of your locos. If you like to “circle burn on flat level track than Ok on long length train consists. 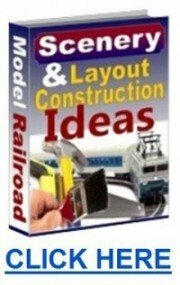 After I built an all wood boxcar kit and put good trucks under it about 50 years ago, I threw away NMRA guides along with all added car weights. Ruling grade on the C&G is about 2% and 40′ cars weigh on average 65 grams. With good wheelsets and careful attention to trackwork there’s no need for four ounce cars. Try it, you’ll be delighted with the increased tractive effort small locomotives. Just as a chain is only as strong as its weakest link, so with a train. The weakest link in a train is the couplers. I’d recommend body mounted rather than bogie mounted couplers (what ever type, it shouldn’t matter”. You have already said your wagons and cars are weighted to NMRA recommendation, but also check your wheel back to back and wobble. 50 cars – that is very long train, is it prototypical? Isn’t that just the definition of a ‘consist?’. Long trains on a gradient calls for more locomotive power. I’ve even seen some old steam need an assist with a diesel pusher for elevation in the hills of NC for example. 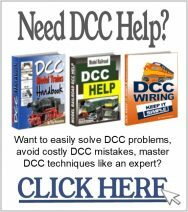 A 2% grade and a DCC consist sounds like a perfect recipe for this system. I had super-elevated curves on my home layout which was small (18″ radius curves) but I loved the realism. I ran 10, 12 car trains because that’s all I had for industries to serve. I never had problems because my track work was meticulous. Good track work is the KEY to good operation so if you do that then your problems should be minimal. The next and just as important factor is your couplers. I have found nothing is better than Kadee, David is right in his suggestion of body mounted couplers. I only use body mounted and be sure your couplers are all at the correct height. This is critical. Good wheel sets are also important, so be sure to get good ones.The next factor is the tractive force of your locos. 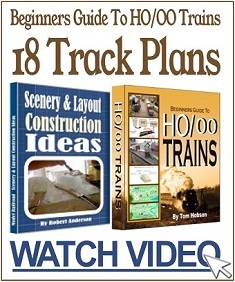 You don’t want to burn out your motors, so be sure you have enough locos to easily pull your trains. I now belong to a club and have had 40 to 45 car trains but the power of the locos can do the work They are in my opinion the best (Broadway Limited). I doublemhead the lead locos and have a pusher behind. Our steepest grade is about 2.5%. I suggest you only purchase the best locos. The extra money is worth it in both run-ability and tractive effort. 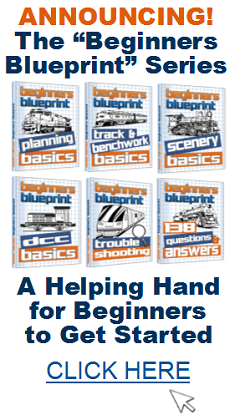 I have been in this hobby for some 60 years now, so “I’ve been there and done that” and know what you need. All The Best To You & happy model Railroading.